Testosterone Pellets! Hormone Pellet Side Effects! I know I bash direct T supplementation, and traditional hormone replacement therapy on a regular basis on this site. Because traditional Testosterone Replacement should be an absolute last resort after everything else has failed! Unfortunately, due to the mindset of the medical establishment, direct T therapy usually comes first. This blunt force approach is not right for everyone. The vast majority of you reading this should not slam the brakes on your body's own Natural Testosterone Production. You shouldn't settle for testicular atrophy either. Both will happen once you begin testosterone replacement therapy. If for some reason you are unable to coax your body into Producing Testosterone, you should be the first guy in line waiting to get your fix. Yup, T is that important! If I had to take the medical route, I'd use this procedure over creams, gel's, patches, or injections. Typically, pellets are implanted every 3 to 4 months. Once the procedure takes place you can forget about them for several months. Unlike other methods, they release small amounts of T into your blood stream, which mimic your body's own T production. 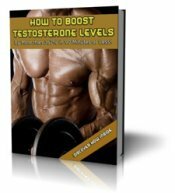 This eliminates the erratic swings in T levels that comes along with other forms of testosterone therapy. Since they are are absorbed slowly, providing a constant and consistent level of hormones into the blood stream you avoid the peaks and valleys found with traditional delivery methods. This greatly reduces the occurrence of side effects. How is a Testosterone Pellet Implanted? The implant procedure consists of a small incision through which a narrow cannula is inserted. The pellets are inserted through the cannula, then the cannula is withdrawn. The incision is then closed with a Steri-Strip, and pressure is applied until bleeding stops. The area is then covered with a dressing.